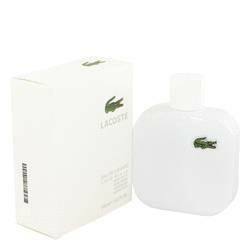 Lacoste Eau De Lacoste L.12.12 Blanc Cologne by Lacoste, Lacoste eau de lacoste l.12.12 blanc is a chypre fragrance for the virile. The reputed fashion brand created the fragrance to unleash a splash of freshness with the mystic woody effects. The top note opens with a citrus splash of grapefruit, with the warmth of cardamom and the softness of rosemary. The floral heart of tuberose and ylang ylang has been balanced with the mineralizing oliban. The leathery base of suede has the woody appeal of cedar wood and the lingering aroma of vetiver. It is available as eau de toilette, suitable to be worn any time.